I have a love and hate relationship with supplements. This because in Belgium supplements need to be made according to some rules of course. But they don’t need to work… So there are a lot of supplements on the market that don’t work… But because I’m vegetarian I need to take some supplements. Personally I prefer the ‘natural’ vitamins. So vitamins on a plant basis. And one of my favorite natural based supplements are from Ortis. And when I got the chance to test out there new detox product for a beautiful and pure skin I wanted to try this directly! What makes this detox cure worth it? Burdock: this helps to improve and get the skin back healthy. Nettle: contribute to a good blood circulation and a purifying and radiant skin. Birch: is known for his purifying characteristics. Rosemary: is full with antioxidants and stimulate the digestion. Psyllium: is full of fibers and helps the digestion. Spirulina: helps to remove the toxin out of the body. Lemon: is perfect for a beautiful skin. As you can see is this for sure a healthy cocktail with only great ingredients! This is a 7 days cure. You best can drink this in the morning because this is not only a boost for your skin but also for your energy! You need to mix 1 stick powder in a glass with 150ml water, milk or some juice. Or you can add it to your morning smoothie. I tried it with water but than the taste was to heavy. So you best can add this to milk, your smoothie or some juice. This is personally… But with water I found the taste to strong. But in my morning smoothie I barely taste it! The taste is hard to describe. It’s a strong taste. But if you love nettle soup than you will love this drink! But if you hate it like me than you best mix this powder with juice or in your morning smoothie! If it is possible than you must drink this for sure in the morning! This really gives you a healthy boost. I tried this for the full 7 days and I’m for sure enthusiast about this cure! Ok, the taste was for sure something that I had to get used too. But when you know the perfect combination then is this cocktail gone before you know! 😉 And yes, it really works! It gave me more energy and I felt so good! And my skin needed for sure this detox cure! Thanks to a lot of stress was my skin horrible. But this detox product helped a lot! It made my skin much better and healthier. My skin was purifying and radiant. So hell to the yes this is a fantastic cure! I’m pretty sure that I’m going to do this cure one till two times a year or more when needed. 😉 If you are looking for a good detox cure for your skin and body? Than stop looking! You need to try detoxine! It’s for sure worth it! (as I said before is the taste heavy and if you don’t find the perfect combination than remember ‘no pain no gain’ but than with a heavy taste ;)) You won’t regret trying out this detox cure! It’s perfect for when you need a detox moment (think during the Holiday 😉 or a stressful period or,…). 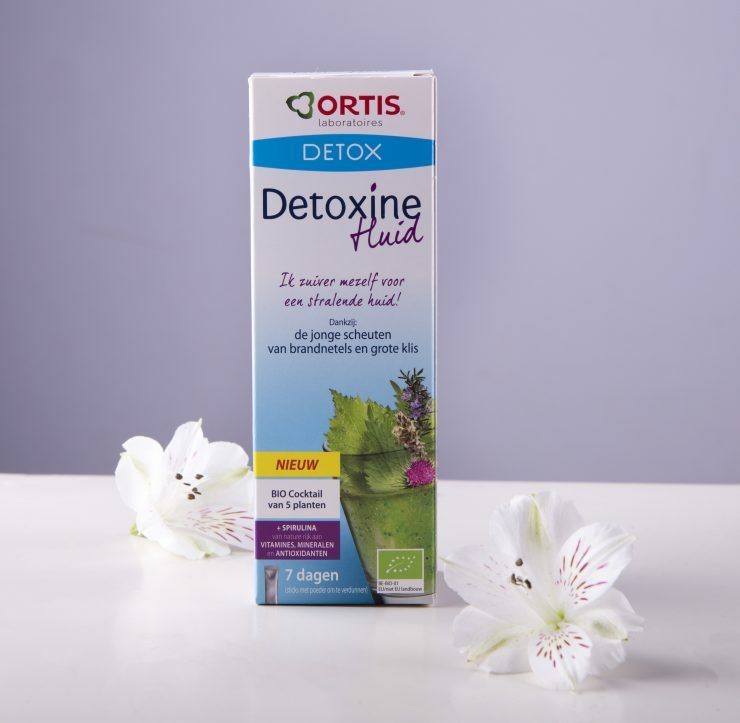 Ortis detox // detoxine skin is around €13,10 for a 7 days cure. Alles wat een beetje energie geeft is positief in mijn boek! Wat fijn dat je er meer energie van hebt gekregen zeg! Ik neem eigenlijk geen supplementen. Ik eet gevarieerd, dus denk niet dat het echt nodig is dan. Sinds dan ben ik begonnen met supplementen. Maar dit is eigenlijk niet echt een supplement vind ik zelf. Goh dit wil ik wel eens proberen. Ik gebruik nu viridian multivitamine. Ook erg natuurlijk. Dat ken ik niet maar ga ik wel eens opzoeken! Wauw, wat een goede tip! Ik kan wel een huid- en haarboost gebruiken! Ja, voor een huid boost is dit echt een toppertje! Oh leuk om te lezen, ik houd zelf wel van detox drankjes. Ik drink zelf vaak detoxthee, maar dit lijkt me toch wel wat heftiger zegmaar! Goede tip. Hm, ik geloof nooit zo in voedingssupplementen die zoveel beloven. Anderzijds, als je effect merkt is het natuurlijk wel de moeite! Ik gebruik zelf geen supplementen en dergelijke. Maar wel fijn dat het voor jou werkt! Ja, ik vond het echt een fijne kuur om 7 dagen te proberen!